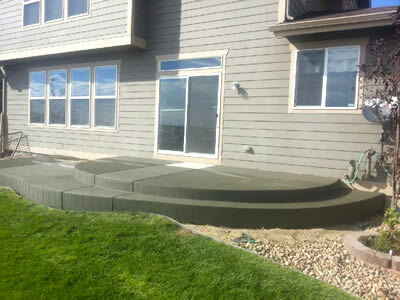 Colorado Concrete in Denver is your concrete patio experts. Whether we are installing a new concrete patio, replacing an existing concrete patio or repairing your concrete patio we have the knowledge, experience and equipment to do your concrete patio properly and safely. Your backyard patio is an extension of your house and concrete will transform your backyard into the retreat you’ve always wanted. Colorado Concrete can remove your old concrete and replace it with a new slab. Concrete can be made to fit any type of landscape and we can stamp, stain or color your concrete giving you that rich look of flagstone, stone, brick or tile.